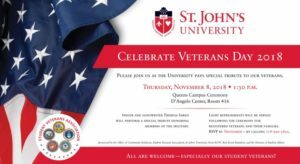 Join in as St. John’s University pays special tribute to our veterans. Singer and Songwriter Theresa Sareo will perform a special tribute honoring members of the military. Light refreshments will be served following the ceremony for registered veterans and their families. RSVP by November 1 by calling 718-990-5892. All are welcome – especially SJU student veterans!